We had first encountered the Mensa Select Award game Forbidden Island via the Wil Wheton web show, Tabletop, and eventually got a copy for ourselves. It was another spin on the cooperative play game similar to Pandemic but certainly still quite challenging. And I don't think we were quite expecting a sequel from Gamewright games, and yet that's exactly what we got. Forbidden Desert is a sequel of sorts to Forbidden Island that features a completely different premise although some similarities in gameplay. And as the name of the game clear indicates, our setting has changed from a sinking island to a dangerous desert. And the game truly shines in how it managed to expand on the original game premise and add so many additional layers of complexity on top of things that truly made use of the whole desert experience. 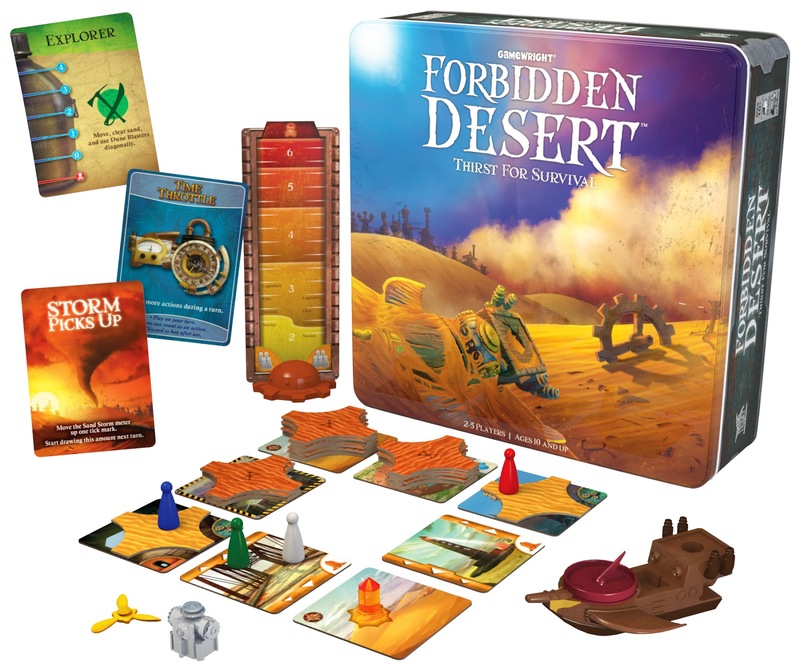 Synopsis: Forbidden Desert is a cooperative strategy game designed by Matt Leacock for Gamewright Games. It was released in 2013 and like Forbidden Island before it, it also won the Mensa Select Award, along with a few other honors. The premise of the game is that your group of adventures have crash-landed in the desert and must now find a way to escape back to civilization. Of course there is a reason you were headed to the desert to begin with - it's just that your expedition didn't start out so well. There are stories of an ancient flying machine hidden in the desert and the players will then use their unique abilities to find the different components that comprise this flying machine and get to safety. This is the only way to win. But as is of the way of these games, there are many ways to lose. The most obvious given the setting is thirst - each player will have a water meter showing how much they have left. Should any of the players reach zero water, then the whole group loses. Another way to lose is if you run out of sand tiles to place on the various tiles. And of course you can lose if the storm reaches too high an intensity. But perhaps I'm getting ahead of myself here. The game obviously shares a lot of common elements with Forbidden Island. You have the modular tile-based game field and you have the unique character roles per character. Some character roles are familiar such as the Explorer (who can movie diagonally) but there are new ones like the Water Carrier (who can share water with other players). Each role can be highly valuable to your effort to survive - it really boils down to how each of you use your abilities to maximum ability. Similar to Pandemic and Forbidden Island, there's a sense of ever-escalating danger with each player turn. First, the Storm will eventually move, as represented by movement cards that tell you how many tiles need to shift around. Each tile that moves get another sand tile placed on top of it. But there's also a chance that the storm will pick up, increasing the intensity and raising the number of cards you draw per turn. And among those cards are also cards that cause the sun to beat down, draining all exposed players of a point of water. But it's not like everything is against you. Apart from the special abilities that each player has, digging up parts of the lost city still reward you with special gear that can help your group out in a pinch.Some gear is as basic as the Sand Blaster, that removes all sand tiles from an adjacent tile. And you some pretty strategic pieces of equipment like the Solar Shield, which protects the tile from the effects of the sun until the player's next turn. Apart from hiding in underground tunnels, the shield is one of the few ways to resist the effects of the sun. With limited actions, an ever-shifting "board", the risk of dying of thirst and a scavenger hunt to find the various parts of the flying machine, there are quite a number of elements to balance out in order to win the game. It took us quite a while before we won our first game on the Novice difficulty and my only advice is to make sure that you take note of all the rules of the game. If you forget any of them, you may miss out on that one key component that will help you win. Forbidden Desert is an amazing update of Forbidden Island, a game that has truly innovated the original concept. It's world away from the first game and quite a lot of fun - even if you lose the first few times. Thus it's pretty obvious that I'm going to rate this game as a full 5 adorable miniature ship pieces that come with the game out of a possible 5.